A deserved re-post of "Babe Ruth in Deadwood"
The 1920’s hadn’t quite begun to “roar” yet, and the devastating dust bowl of the 1930’s was still a decade away. Baseball had become the national pastime, and for residents of the northern Black Hills, it didn’t get any better than a fall day in 1922 when the legendary Babe Ruth came to Deadwood as part of a nationwide “barnstorming” tour with Yankee teammate Bob Meusel. 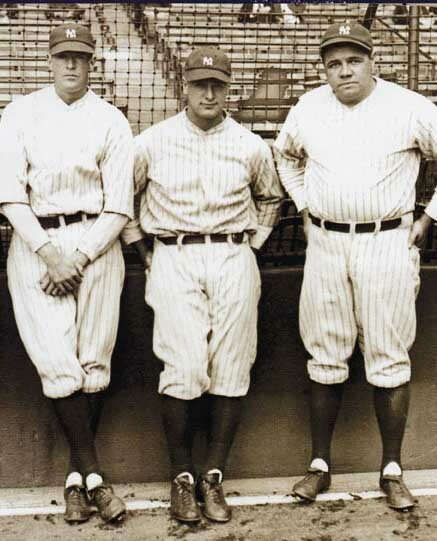 Although Ruth had begun to ascend as a baseball star by 1921, it was an unusual season — his second year with the New York Yankees, and he blasted 59 home runs that season, helping the Yankees to win the American League pennant and face cross-town rival the New York Giants in the World Series. Ruth was injured in the second game of the series, however, hampering his performance for the remaining games. The Giants won the series. It wasn’t long before Ruth was on the road in a “barnstorming” tour, which was a violation of the rules for world series players. Commissioner Kenesaw Mountain Landis suspended Ruth for the first six weeks of the 1922 season. 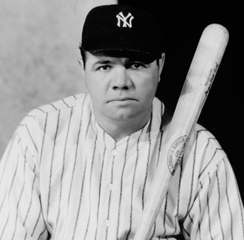 Although he batted .315 that short season, it was rather a disappointing one for the Babe. It ended with yet another lost world series – again to the New York Giants. apparently was not with "the Babe." We don’t know if Ruth was suspended for his 1922 encore barnstorming tour, but he surely delighted folks in western South Dakota when he and Meusel appeared for the seventh in a series of exhibition games across the west one day in late October. He and Meusel journeyed by train from Sioux City, Iowa, to Norfolk, Nebraska, and then on to Sturgis. There, they were greeted by an entourage of Deadwood businessmen who drove the big leaguers by automobile over the “Boulder Park Highway” to Deadwood. The Deadwood Daily Pioneer-Times, in its October 19, 1922 edition, reported their arrival in great detail. “In honor of the event, practically all of the Deadwood business houses will be closed, most of the Black Hills will declare a holiday; the local schools and the Spearfish Normal will be closed this afternoon, and a general holiday will be in effect during the time of the game this afternoon between the hours of 2 to 4 o’clock.” Ruth and Meusel were “entertained at a luncheon” and then transported to the Amusement Park for the game. 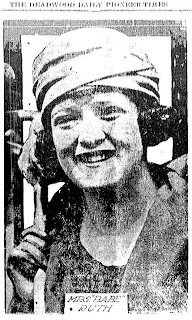 An advertisement in the paper encouraged readers to “See Babe Ruth and Bob Meusel, American League World Series Stars, hit a home run in an exhibition baseball game at Deadwood Amusement Park today.” Ruth was selected to play with the Deadwood team, which had just won the 1922 Black Hills League championship, while Meusel played for the Black Hills All-Stars, a group of players from the other five teams in the league, Lead, Spearfish, Sturgis, Rapid City, and Aladdin. Both Ruth and Meusel would play first base. By all accounts, it was a good game, but the big league sluggers provided no home runs. The newspaper reporter who covered the event seemed not terribly impressed by the two Yankees. “The high altitude or the background may have affected the sluggers. At any rate, those who saw yesterday’s contest saw nothing that should cause thirty-five thousand New York fans to stand in line from daylight in the morning until two o’clock in the afternoon to secure a ticket, permitting them to see these fellows perform,” he wrote. Meusel was an unimpressive one for four at the plate for the day, while Ruth was two for three. But it was the bottom of the seventh inning that seemed to especially delight the reporter. Babe Ruth pose for this undated photograph. After the game, Ruth and Meusel boarded the Northwestern passenger train headed south to Scottsbluff, Nebraska, for yet another exhibition game – and no doubt more thrills for local fans. Maybe even a home run for the Babe, which he was denied in Deadwood that fateful day in 1922. Whitewood, South Dakota will be placing a plaque on the sidewalk where Calamity Jane had her last photo taken. Stay tuned for more details!